Parliament remained dysfunctional for the fourth day in a row today with the Opposition continuing to demand a debate on FDI in multi-brand retail under rules entailing voting. In both Houses, the BJP, the Left and the TMC members kept agitating for the FDI move to be rolled back. Senior IPS officer Alok Joshi has been appointed as the chief of country's external intelligence gathering agency — Research and Analysis Wing (RAW). According to an official order issued today, Joshi (59), a 1976 batch officer of Haryana Cadre who is at present Special Secretary in the RAW, will take over the reins of the agency on December 30. Kanhaiyalal Gidwani, the co-promoter of the controversial Adarsh Co-operative Housing Society, died early this morning at the Breach Candy Hospital following a heart attack. For thousands gathered at the Jantar Mantar here today to debate the pending anti-corruption and whistleblowers protection Bills at the ongoing Jan Sansad, which entered its second day, it was a moment of truth when the brother of slain whistleblower Satyendra Dubey told them that no justice had been done in the case. Leader of Opposition in the Rajya Sabha Arun Jaitley today lashed out at the Congress-led UPA government for making “unreasonable” and “unacceptable” arguments on FDI in multi-brand retail, saying “the government doesn’t want the Parliament session to run”. “The whole essence of democracy is voting-the will of the people and the will of sovereign. And for the government to contend that the issue must be talked about, but never voted upon is without any basis. Voting and democracy co-exist. The process for selection to IITs and other central technical institutions through a common entrance test replacing the erstwhile IIT-JEE and AIEEE has kicked off. The CBSE is now accepting online applications for rechristened JEE Main, with HRD Minister MM Pallam Raju fully backing the new format that his predecessor Kapil Sibal had mooted. The Bahujan Samaj Party (BSP) today raised the demand for reservation in the mining sector for backward classes which survive on activities related to the rivers. Actor Aamir Khan today expressed concern over the alleged murder of Abdul Hakim (29), who was shot dead at his village in Bulandshahr, Uttar Pradesh. Aamir said he is writing to the state authorities and Chief Minister Akhilesh Yadav, requesting them to initiate a fair investigation into the matter. Outgoing CBI Director Amar Pratap Singh today said the CBI had not arrived at any loss figures in the 2G Spectrum scam during its three-year probe while terming it the “biggest scam” of his tenure. Addressing mediapersons, Singh said his two-year tenure as the agency head started on a rocky note as immediately “we had the 2G scam monitored by the Supreme Court almost on a daily basis, the Aarushi Murder case, the Adarsh scam and the CWG on our hands. The Supreme Court today said telecom operators whose licences were cancelled by it, but continued to operate due to delay on government's part to hold fresh auction of 2G spectrum, might have to pay for using the radiowaves on the basis of current price. The government today said all private and public limited companies with a turnover of over Rs 100 crore for the past three consecutive years will now be allowed to set up technical colleges. Two senior journalists of Zee news channel were arrested here today on charges of trying to extort Rs 100 crore from Congress MP Naveen Jindal’s group for not doing news reports on coal scam linking his firm. In the strongest-ever statement made against the Indian Ocean archipelago, India tonight slammed the decision of the Maldives to cancel the $500 million contract given to Indian infrastructure major GMR Group for developing Male Airport. Parliament remained dysfunctional for the fourth day in a row today with the Opposition continuing to demand a debate on FDI in multi-brand retail under rules entailing voting. 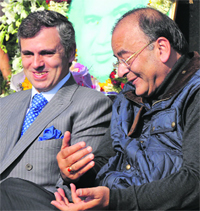 In both Houses, the BJP, the Left and the TMC members kept agitating for the FDI move to be rolled back. The DMK demanded a discussion on the 2G Spectrum issue following fresh revelations by former auditor RP Singh who has disowned the 2G Spectrum scam loss figure of Rs 1.76 lakh crore. In the Lok Sabha, Speaker Meira Kumar's repeated pleas to the agitating MPs of the BJP, the TMC, the DMK and the Left parties fell on deaf ears. She kept asking them to let the Question Hour run. She even appealed to the women MPs in the well: "The first question is on crime against women. Please go back to your chairs and let the House run. Ask questions," she said, with no one heeding. She adjourned the House until 12 noon. When the House reassembled, TMC member Saugata Roy read out a statement under Rule 199 explaining reasons for his resignation as a Central minister following TMC's withdrawal of support from the government. 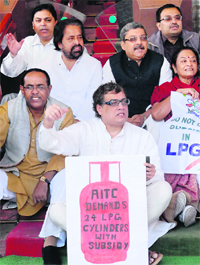 Alleging that his statement (laid on the table of the Lok Sabha) explaining his resignation had been severely edited, the former Minister of State for Urban Poverty Alleviation said the resignation came after the TMC withdrew support from the UPA following its decision to hike petrol prices, reduce the cap on LPG subsidy and finally permitting 51 per cent FDI in multi-brand retail. No business could be transacted in the Lok Sabha and it was finally adjourned for the day at 2 pm after running for a minute. The Rajya Sabha was adjourned following ruckus by Left, BJP and DMK members at 12 noon. In the Lok Sabha, Speaker of Hungarian parliament was watching from the gallery as MPs disregarded Meira Kumar's pleas to run the House. The BSP kept demanding dismissal of the UP government led by Akhilesh Yadav; the TMC sought rollback of FDI in multi-brand retail; BJP members were shouting "FDI vapis lo" and DMK members were flashing copies of a newspaper report carrying versions of RP Singh who has questioned the 2G Spectrum loss figures of Rs 1.76 lakh crore. The DMK has already given notices in both Houses of Parliament to discuss the matter in the light of RP Singh's insinuations that Public Accounts Committee chief MM Joshi tried to influence CAG to induct the loss figures. The Appointments Committee of Cabinet headed by Prime Minister Manmohan Singh approved Joshi's appointment as Secretary (RAW) for a period of two years or until further orders, whichever is earlier, the order said. Joshi will succeed Sanjeev Tripathi whose tenure ends on December 29. A former member of the Maharashtra Legislative Council Gidwani, who had represented the Congress party in the past, was arrested last March in connection with the controversial project in which retired defence officials, bureaucrats and politicians got flats allotted to themselves at low prices. He had secured bail earlier this year. Gidwani was admitted to hospital two days ago after he complained of breathing problems. In his submissions to the judicial commission probing the scam, Gidwani submitted that his contacts with politicians helped push the project through. Making his submissions to the JA Patil and P Subramaniam commission on Tuesday, Gidwani said politicians and bureaucrats known to him helped in the allotment of the South Mumbai plot where the Adarsh housing society is located. Today’s events coincided with the death anniversary of Satyendra, former Project Director of the National Highway Authority of India, who was killed on 27 November, 2003 for exposing corruption in contracts. His brother Dhananjay Dubey told the gathering today that no one had been brought to book in the murder case. “There can be no bigger travesty of justice than what has been done to my brother Satyendra Dubey, who laid his life for removing corruption. The irony is no one has been brought to books till date and even in the face of all this violation, we see a complete lack of political will to pass the Whistleblowers Protection Bill,” Dhananjay said. Dhananjay rooted for early passage of the Whistleblower Protection Bill as the gathering observed silence in the memory of those killed in the past for exposing corruption. Leader of Opposition in the Rajya Sabha Arun Jaitley today lashed out at the Congress-led UPA government for making “unreasonable” and “unacceptable” arguments on FDI in multi-brand retail, saying “the government doesn’t want the Parliament session to run”. “The whole essence of democracy is voting-the will of the people and the will of sovereign. And for the government to contend that the issue must be talked about, but never voted upon is without any basis. Voting and democracy co-exist. They are not alien to each other. By raising such unreasonable and unacceptable arguments, the government is showing its intentions that it doesn’t want the session of Parliament to run,” Jaitley told reporters on the sidelines of a function here. Jaitley, who was in the town to pay tribute to former minister and his father-in-law Girdhari Lal Dogra on his 25th death anniversary, said the argument of the government that there must be a debate without a vote “has no basis”. Senior BJP leader said there were voting provisions in the regulations for the conduct of both Houses of Parliament. “Therefore, those regulations are not futile and they were not enacted without a purpose,” Jaitley said. On the strongly worded letter to BJP national president Nitin Gadkari by Ram Jethmalani wherein he had accused him of having a role in the CBI Director’s appointment controversy, Jaitley refused to get into a war of words with Jethmalani, saying he didn’t think that he (Jethmalani) deserved a reply anymore. Earlier, Chief Minister Omar Abdullah, who was the chief guest at the function, paid tribute to late Dogra and described him a “real friend of the people and man of high stature”. The letter also attacks the Leaders of Opposition in two Houses of Parliament Sushma Swaraj and Arun Jaitley for their opposition to the appointment of new CBI chief Ranjit Sinha. Daring the party to expel him, the noted lawyer said he was ready for the action. “If I am guilty (of making false allegations), they will expel me... I am ready for it,” he told the media here. “Gadkari incident (of facing allegations of corruption) has hit the image of the party... they will lose millions of votes... I am not responsible for their lack of wisdom,” he said. The BJP has yesterday issued a show-cause notice to Jethmalani, asking why he shouldn’t be expelled from the party. He, however, claimed the notice had not reached him yet. The IIT alumni is still opposing the move and had met Raju a fortnight ago in this connection. The minister has, however, clarified that JEE Main (for admission to all central technical institutions, except IITs) and JEE Advanced (for further admission to IITs) would be held in 2013. Top 1.5 lakh scorers of JEE Main would qualify to take JEE Advanced test which the IITs would design. Other institutions such as the National Institutes of Technology will admit students depending on the merit list of the JEE Main. The JEE Advanced would be exclusively held for admission to IITs. The process of online application for the JEE Main commenced on November 8 and would end on December 15, the CBSE said. The result of the JEE Main-2013 would be announced on May 7 and the website for eligible candidates to register for the JEE Advanced would become functional on May 8, 2013. The CBSE today said several aspirants for the JEE Main-2013 had committed mistakes while filling their online registration forms. “The board will display particulars of the candidates on the JEE (Main) website in the second week of January, 2013, so that these candidates can rectify their incorrect particulars, except the change of examination cities and option for change of mode of examination from computer-based examination (online) to pen-paper-based examination (offline),” the board said in a statement. When the Samajwadi Party (SP) government expressed its inability to accept the demand, the BSP staged a walkout followed by the BJP and the Congress. During question hour in the Vidhan Sabha, Leader of Opposition Swami Prasad Maurya said communities like Nishad, Mallah, Kevat, Bind and Machua make ends meet on activities like boating, fish-catching and trade of coarse sand that is found along the river banks. “If the government is sincerely concerned about the welfare of these castes, it should ensure that mining contracts are allotted to persons from these groups,” he said. In an alleged case of honour killing, Hakim was gunned down in his village on Thursday when he had gone to buy medicines for his eight months’ pregnant wife. Hakim was a participant in Aamir’s television show ‘Satyamev Jayate’ based on social issues. He appeared in one of its episodes dedicated to cast light on the increasing number of honour killings in parts of Uttar Pradesh. Aamir said he has requested police officials to provide protection to Hakim’s family members and punish the guilty. Hakim is survived by his 26-year-old wife and a daughter. “We have asked the police there to conduct a fair investigation into the matter so that the guilty is booked. We have requested them to provide security to his family members,” the actor said. Aamir said they were disappointed with the fact that they could not highlight Hakim’s story in the programme which might have averted the incident. “We had personally heard Hakim’s story but we could not show it in the programme. So we made him part of the audience. Now, I think had we shared his experiences, the incident might not have taken place,” said Aamir. * Abdul Hakim (29) was gunned down at his village in Bulandshahr, Uttar Pradesh, on Thursday. Outgoing CBI Director Amar Pratap Singh today said the CBI had not arrived at any loss figures in the 2G Spectrum scam during its three-year probe while terming it the “biggest scam” of his tenure. Addressing mediapersons, Singh said his two-year tenure as the agency head started on a rocky note as immediately “we had the 2G scam monitored by the Supreme Court almost on a daily basis, the Aarushi Murder case, the Adarsh scam and the CWG on our hands. The entire CBI worked as a team and was able to produce results in all these cases, especially in 2G case”. The 2G was the biggest scam “because of the complications involved and the case was monitored by the Supreme Court”, said Singh, who demits office on November 30. About the figures given in its charge-sheet, the CBI Director said the figure of Rs 30,000 crore was 3.5 times the indexed price of 2001. “But we had not termed it as loss. It was a notional figure,” Singh said. “Soon after the charge-sheets were filed in the 2G case, the organisation had to face the heat of the Jan Lokpal and the Lokpal Bill. In the Jan Lokpal Bill, it had been suggested that the anti-corruption wing of the CBI should be merged with Lokpal, while in the Government Lokpal Bill it was proposed that Lokpal might be given a separate agency, suggesting that the CBI would no longer be involved in anti-corruption work,” the CBI Director said. A bench of Justices GS Singhvi and KS Radhakrishnan said it would consider asking the operators to pay for using spectrum as they continued to operate because of delay in auction by the Centre. "Those licensees which were operating because of delay in auction must pay. They could not have operated if auction would have happened. We would ask the operators to pay for using spectrum after four months time," the bench said. In response to a related query on the subject, Minister of State for Human Resource Development Shashi Tharoor told Parliament that the decision had been taken by the All India Council for Technical Education (AICTE) in view of the lack of skills among the graduates being churned out by colleges. The new rule would be applicable from next year. “The AICTE has allowed from 2013-14 private limited or public limited companies/industries having a turnover of at least Rs 100 crore per year for previous three years to establish new technical institutions in engineering and technology, pharmacy, architecture, town planning, hotel management and catering technology,” Tharoor said in a written reply. The arrests on charges of extortion came following the registration of a case about 45 days ago on a complaint filed by Jindal’s company with the Delhi Police’s Crime Branch. Sudhir Chaudhary, head of Zee News, and Samir Ahluwalia, head of Zee Business, have been arrested, a senior police official said. Jindal had last month released a CD which purportedly showed footage in which the Zee journalists were trying to strike a deal with his company officials, telling them that their channel will not air negative stories of Jindal Group if the money is paid to them. "We call upon the Government of Maldives and all parties concerned to ensure that Indian interests in Maldives and the security of Indian nationals are fully protected. The Government of India proposes to monitor the situation in Maldives closely and is prepared to take all necessary measures to ensure the safety and security of its interests and its nationals in the Maldives. The Government of India will continue to be seized of the matter," MEA spokesperson Syed Akbaruddin said in response to a question. He said the investment by GMR represented the single largest foreign direct investment in the history of Maldives. Earlier in the day, the Maldives Cabinet decided to terminate the agreement, which would cancel the largest FDI into Maldives. Maldives President Mohammed Waheed had recently termed GMR's airport project near Male a “bad contract”.